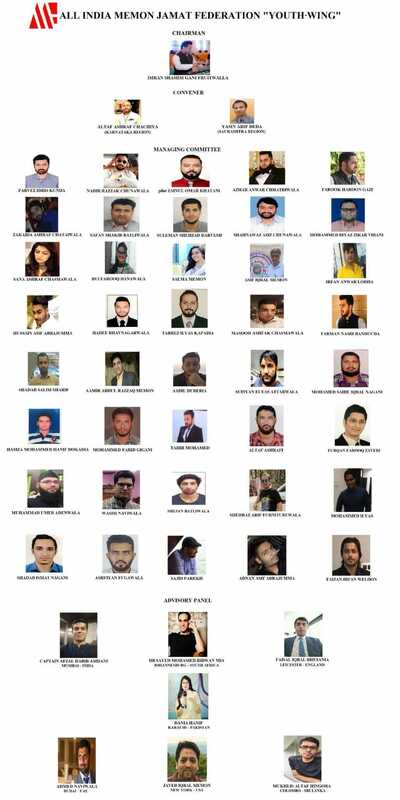 Glad to announce, Alhamdulillah the Youth Wing committee (national level) of All India Memon Jamat Federation has been formed. This committee has been formed with the approval of honorable president Mr. Iqbal Memon Officer & it is highly recommended by the Chairman Mr. Imran Shamim Gani Fruitwalla. All the youths have confirmed their commitment and ensure that they will work hard to uplift lives of the unfortunate ones on this great platform of AIMJF. Happy to see the well educated and prominent family youths of memon community coming together on one platform to work for human welfare. Also, dignified youths from India, USA, UK, SouthAfrica, UAE, Pakistan & Sri Lanka are associated with the AIMJF youth wing as a advisory panel member. Wishing all the best to everyone.